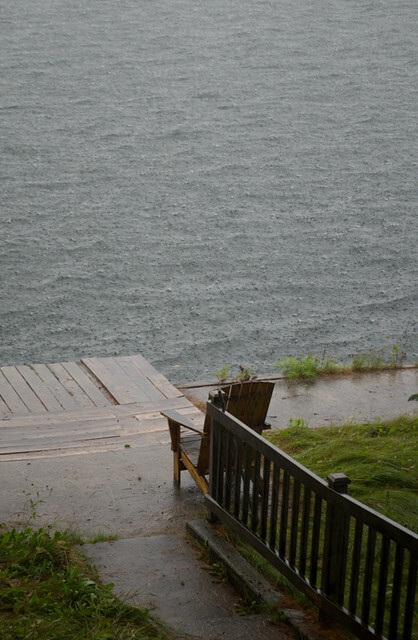 This past Friday, September 21st, the Ottawa-Gatineau area experienced two tornadoes. We’d had tornado warnings in the past which never amounted to much more than a nasty storm with high winds, so I honestly had expected the warnings to be down-graded just like every other time. Actually, I was out photographing the promotional photos for my last post minutes before the storm struck. I was editing them as the wind picked up, thunder rumbled, and the deluge started. My family was extremely lucky: the tornadoes never came close to us. The stronger tornado, a high E/F3, flattened parts of Dunrobin, and then moved on to Gatineau. 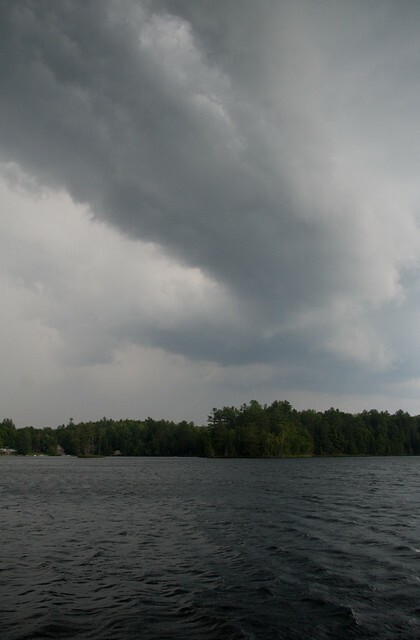 The second twister, a E/F2, moved through the southwest end of Ottawa. The thing that I think a lot of people not from around here don’t understand — especially those in the central part of the US, where they get something like 500 tornadoes a year — is that tornadoes are extremely rare around here. So far as I can tell, we’ve never even had one of any strength touch down in Ottawa (although there was an F1 that hit Gloucester in 2000). Because of this, we’re really not prepared for them! Our natural disasters tend more towards slower, cumulative events, like extremely cold and harsh winters, ice storms, and floods. Nobody has a storm cellar, although most single family homes have a basement or are built on a concrete slab — no crawlspaces under homes here unless it’s a motor/mini home, since with our winters pipes and floors would freeze. We don’t have tornado sirens or drills; the emergency alert that was supposed to be sent to all cell phones in the area simply did not reach a lot of customers. I know that I got the message, but my husband didn’t; my father did, but not my mother. Many people continued on with their days as usual, knowing that a storm was brewing, but with no idea of how strong it would be. As a city, we are extremely lucky that no fatalities have been reported so far, although some people are in critical condition. But it’s pretty obvious once you go push through the branches to the back yard and look toward the front. 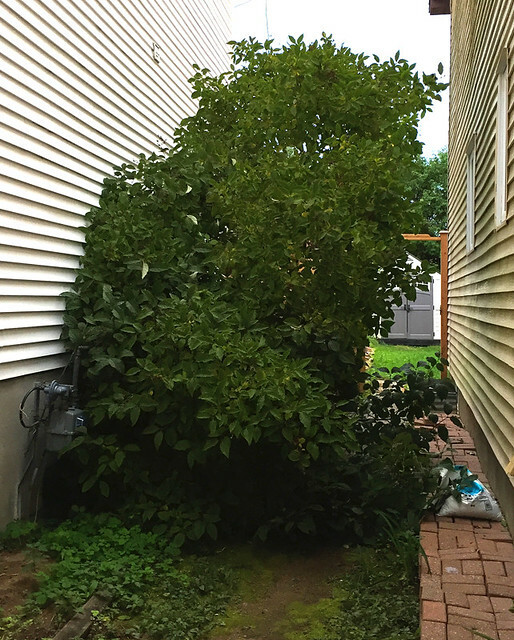 Despite the roots snapping, I count us extremely lucky because the bush (okay, it was over two stories, so it was more of a tree) fell away from the brand new back fence, and didn’t seem to do any damage to the houses as it fell down. 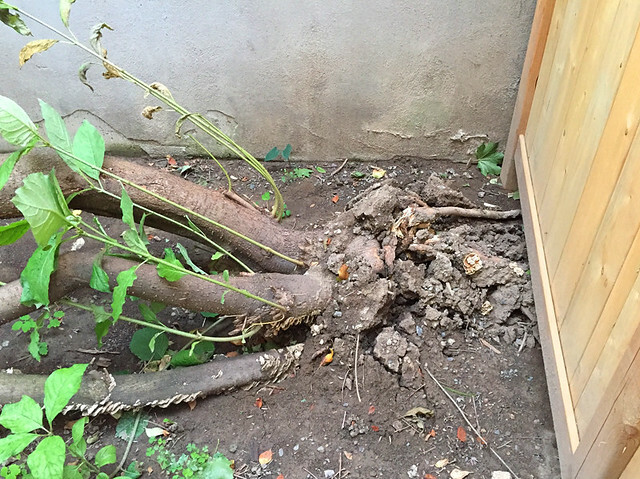 Since it had multiple smaller trunks instead of one big one, it didn’t have the same impact as a true tree. 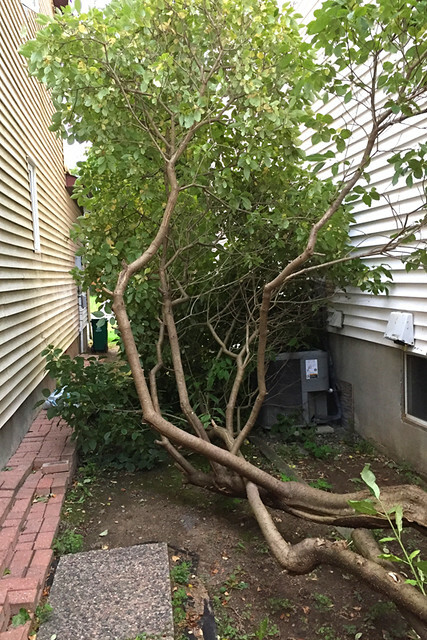 I’m going to spend today cutting it apart and putting it out for garbage collection, and after that we should be able to tell if it damaged the neighbour’s air conditioner or gas meter at all. Once again, I would like to reiterate that my family and friends are all fine, although many people I know experienced minor property damage and others went 48+ hours without power. My sincere thanks go out to the city’s emergency services, who responded quickly and efficiently to the disaster. I would also like to thank the electricity company employees who have been working tirelessly to restore power to the city, which was made especially difficult by the Merivale transmission station being taken out by the tornado. They’ve managed to route power around this station and restore power to hundreds of thousands of customers in just over two days, which is exceptional, in my personal opinion. – Donate money to the Canadian Red Cross, who are providing hot meals to those in need. – Donate food or money to the Ottawa Food Bank, who are providing supplies so that the Salvation Army can distribute hot meals, as well as helping people in need to replace the food that they have lost due to the power outages. – Donate food to the Kanata Food Cupboard, who will redistribute the food to those most in need. – Donate furniture, clothing, or household items to Salvation Army Thrift Stores; if you have larger items, you can arrange to have them picked up for free by calling 1-613-247-1435 ext. 228. – Donate personal hygiene products and non-perishable foods (they now have more than enough donated clothing) in the former Sears location on the ground floor of Galeries de Hull (320 boul. Saint-Joseph, Hull sector) in Gatineau. – Donate money to the Ottawa Senators’ GoFundMe, who have pledged to match donations up to $25,000. Since cooking was off the table the night before, we started Day 2 of the big family trip to the cottage with a hot breakfast even though the temperature and humidity were already starting to get out of hand. 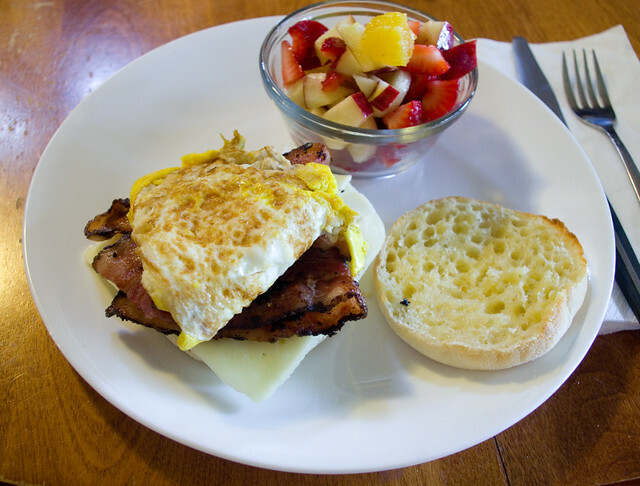 I fried up bacon and eggs over hard while Mom cut up fruit for a salad and toasted up English muffins. The end result was homemade breakfast sandwiches and fruit salad, with whipped cream and/or maple syrup for those who wanted it on the latter. 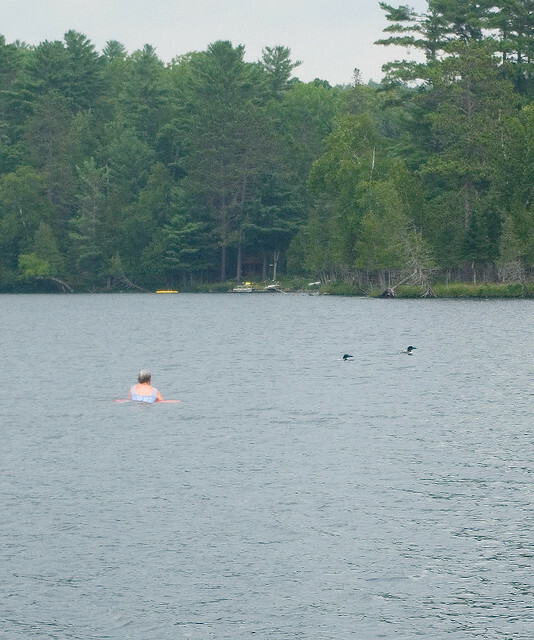 Where, at least until the kids came down and started making the normal kid amount of noise, some of the adults got to swim with the lake’s resident loons. And then the heavens opened up. This meant that we were cooped up inside for a while (I don’t object to playing in the rain, but I draw the line at thunder and lightning). We played cards and taught the kids the game of “Spoons”. Luckily the downpour also brought down the temperature, or we wouldn’t have had the energy for such a competitive game. 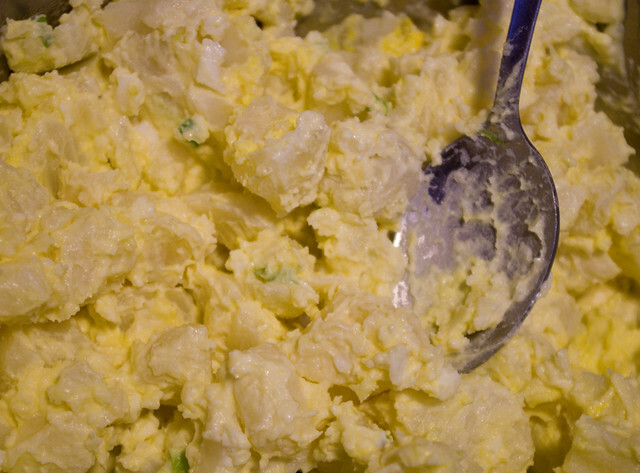 Followed by more of Mom’s potato salad (sans bacon). 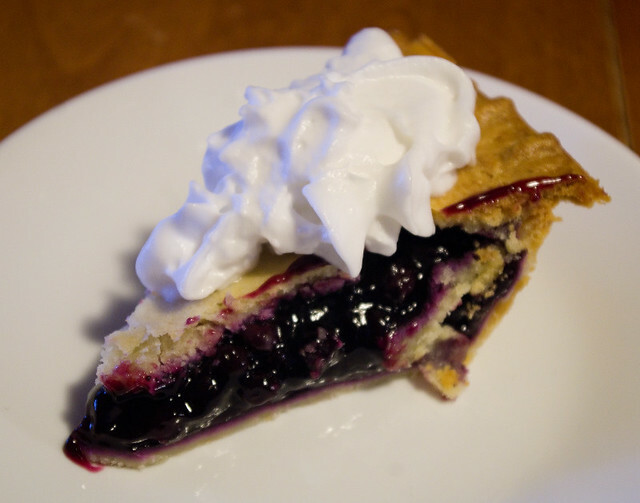 For dessert we absolutely had to finish off the blueberry pie and coconut-based whipped cream substitute that Mom brought. Oh, the hardship. Last night we had my brother-in-law over for dinner again, so I had to make a meal that was filling enough for a family of four and a grown man who is seriously into Muay Thai. 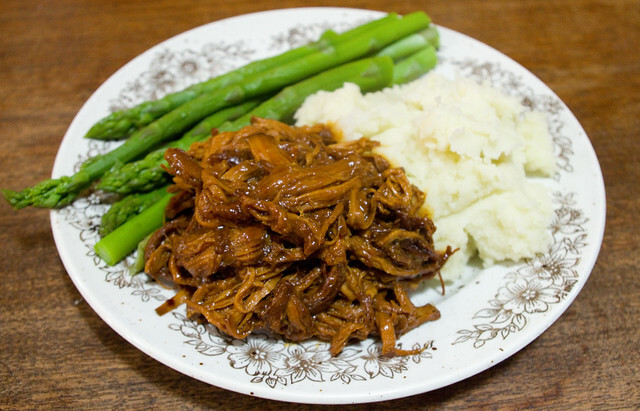 I settled on pulled pork, using my trusty formula (not really a recipe per se). This time I served it with mashed potatoes and steamed asparagus, although it would have been a perfect day to run the oven and make some fresh bread. I don’t think it went above 15°C (59°F) and it rained most of the day, so it was pretty damp as well. That’s not horrible weather for spring, but by the time we hit June around here we expect it to be a bit warmer. I have been kind of hoping to start working on my garden this week, but the weather just hasn’t been cooperating. At this point I’m just growing a fantastic crop of weeds, and that’s just sad. I can do better than this. Sunday going into Monday we had one heck of an ice storm. It was possibly as bad as the one in 1986, but nothing close to 1998. Even so, 43,000 people in town lost power and the city was turned into a virtual skating rink. 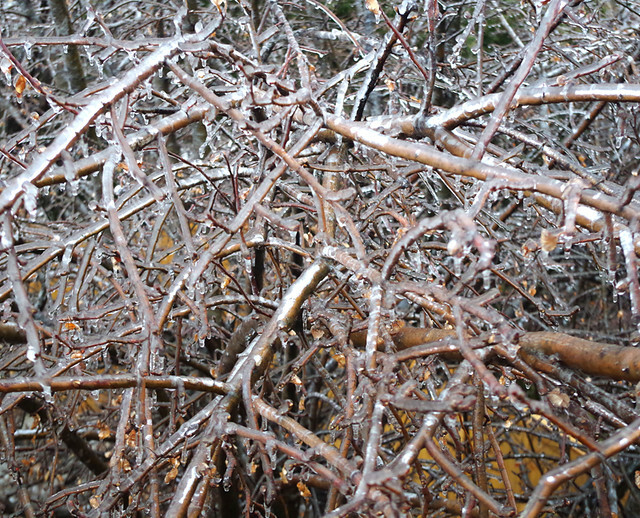 Apple tree branches encased in ice. 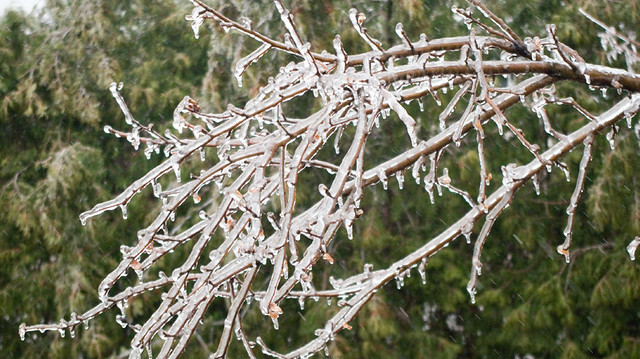 Now, freezing rain isn’t a new thing in this city. But this is the latest that I can ever remember it closing everything down — I mean, it’s April, for crying out loud! My kids had a “snow day” (“ice day””?) yesterday. It’s nuts. 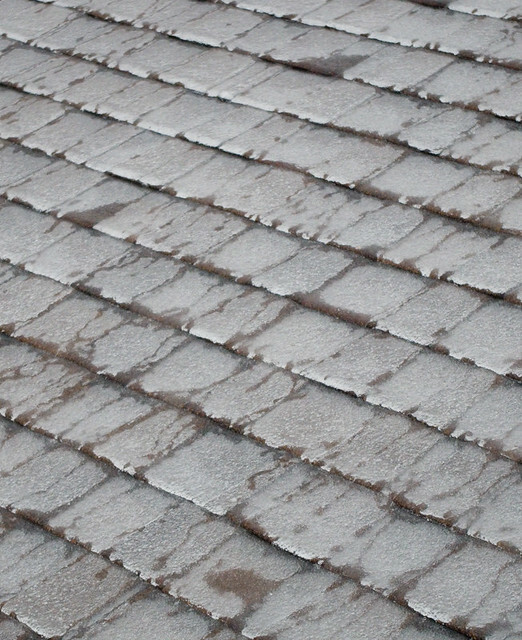 It got even more dangerous to be outside as the day went on and the temperatures rose, causing the ice to start falling off the trees and the roofs. Some people had flying ice shatter the windshield of their car. Everyone avoided the areas around buildings and trees to reduce the likelihood of being brained. At least here in Ottawa we don’t have any super-tall buildings like the CN Tower dropping big chunks of ice onto other buildings and damaging them. 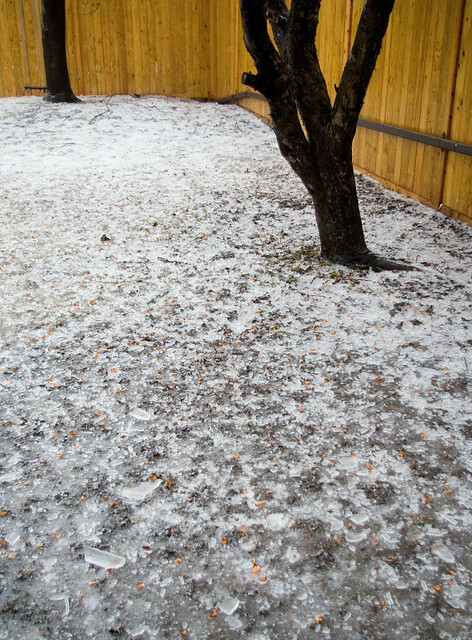 As the sun set, the ground was covered in a few centimeters of slick ice from the freezing rain, and then another layer of broken ice from the branches and buildings dumping their loads. Many of the ice chunks were bigger than my hand, and almost two centimeters thick. Pain perdu served with sliced apples. Right before a big storm like this, around here the things that people tend to stock up on are milk, eggs, and bread. I think this is because, with a typically Canadian mentality, we tend to have lots of food put by in the freezer or the pantry to get us through bad weather, but we tend to run out of perishables. A common joke based on this trend is that everyone wants to make French toast when the weather is stormy (a dish which is comprised primarily of these three ingredients). 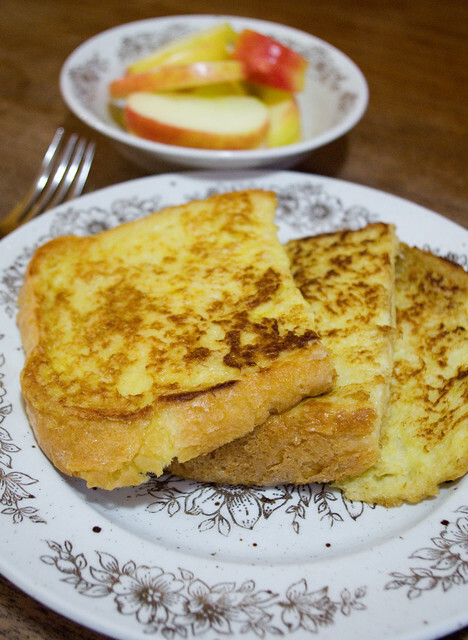 Now, I don’t think I’ve ever made French toast during a storm before, but I was looking for a quick and easy meal for last night, so I figured why not? I had the supplies, after all. I’d made Egg-Enriched White Loaf (page 67, Bread Machine: How to Prepare and Bake the Perfect Loaf (Jennie Shapter (2002)) earlier in the day (although I’d had issues with the amount of liquid and had to add more than the recipe recommended). I sliced that bread thickly and used the recipe for Pain Perdu on the Restigouche from page 19 of Anita Stewart’s Canada (2008) for the coating. (Yes, the book I had on reserve finally came in at the library.) I do know how to make French toast the way my parents taught me, which has rather more eggs and less milk (I used almond milk in any case), but I rather liked this new way of doing it. Hopefully the weather will clear a little Tuesday so that my house-bound children can get to school, and this stir-crazy mom can get out of the house, if only for a coffee! The other day we had a couple of friends over for dinner at the cottage that my parents are renting, which is always a lovely way to spend an evening. 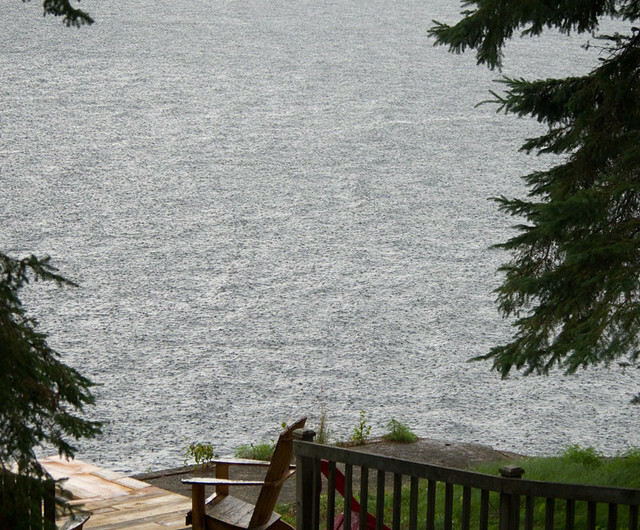 I feared that our plans may have been dashed when a harsh wind blew in from the west, raising whitecaps on the lake, and causing the power to flicker. 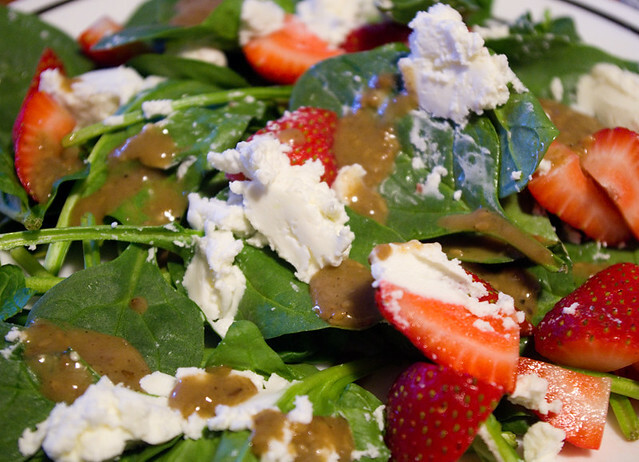 I was afraid that I wouldn’t get the chance to finish cooking dinner before the incoming storm knocked the power out entirely, and we might have to serve our guests peanut butter and banana sandwiches and leftover salad. Luckily, although the power went down for a few seconds here and there, it was on for long enough to prepare a decent meal — even though we kept candles lit and flashlights on hand anyway just in case. We had a plethora of leftover salads to choose from: potato salad, macaroni salad, coleslaw, kale and cabbage salad, and some spinach & fruit & goat cheese salad like I’d had a few days previous. 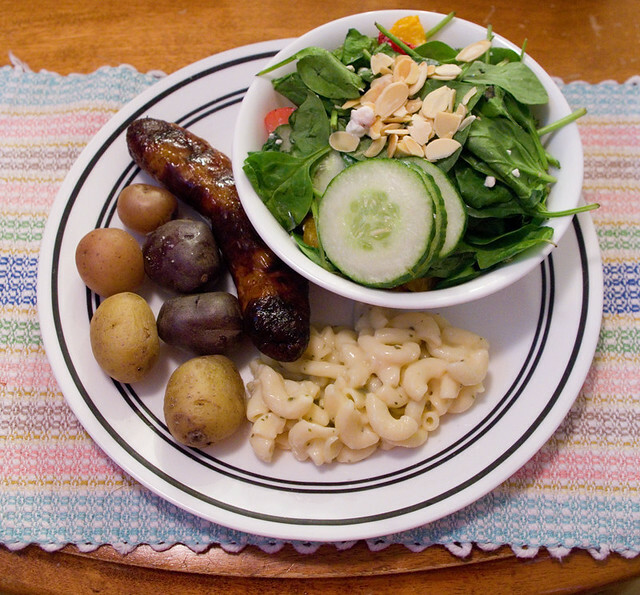 I picked the spinach and macaroni salads for myself, along with a sweet mustard baked sausage, and some boiled baby potatoes. Once the storm blew in, the wind let up a little bit, with torrential rain, lightning, and thunder taking the center stage. My photos are exposed so that it’s possible to actually see what was going on outside, but to the naked eye it was as if dusk had arrived hours early. 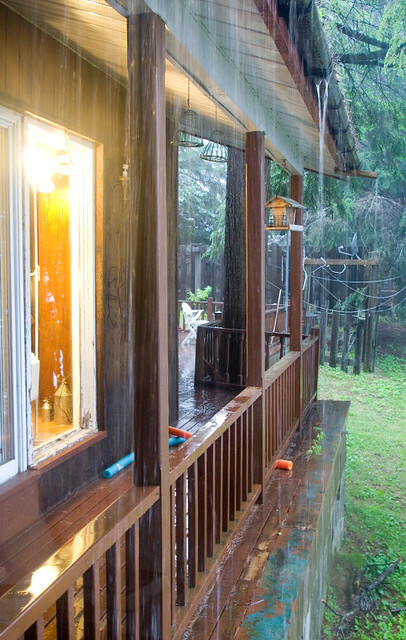 I felt truly lucky to be indoors watching the weather under a good, stout roof — even a roof with gutters plugged with pine needles so that the water cascaded over them instead of flowing down the pipes. 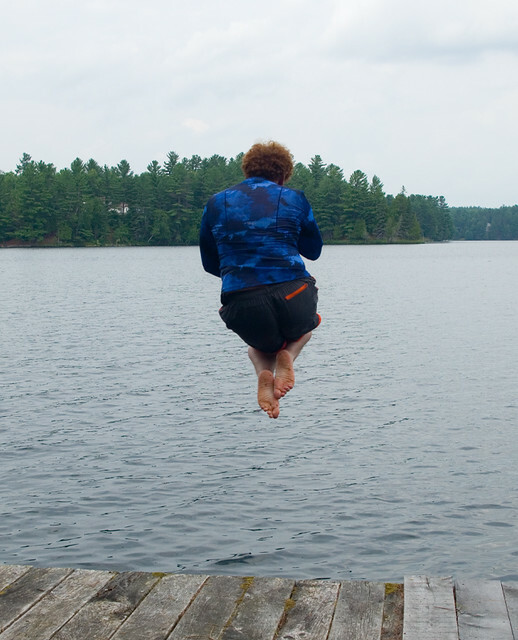 Instead of enjoying a lovely dinner at the cottage watching nature’s show, we could have been on a family camping trip.